In the first blog of this series I explained why it is so important that we make the case for investment in preventive activity, as highlighted in the NHS Five Year Forward View. If we are to ‘get serious’ about prevention, we need to look at the economic arguments that justify these types of initiatives and public health investments more broadly. Two of the key questions that we need to address are: how cost-effective is prevention activity in general? And what are the most cost-effective public health interventions? These questions are of course even more important in the context of tightening budgets in both the NHS and local government. Frequently quoted is the £30bn NHS funding gap, while the gap between local government income and expenditure is forecast to rise to around £14bn by 2019-20. As well as focusing on the cost-effectiveness of new interventions, we have to be sure that we are using resources efficiently now. Are we allocating resources to the right activities (the ones that achieve the best outcomes within the resource envelope) and are we delivering those outcomes in the most efficient ways? This blog will explain why most public health investments are cost-effective, meaning they generate a better outcome than the next best alternative use of resources. Owen et al (2011) summarised evidence relating to around 200 public health interventions, including smoking and alcohol prevention and physical activity. The research showed that the vast majority of these interventions are highly cost-effective, in most cases far below the typical NICE threshold of £20,000 per Quality-Adjusted Life Year (QALY). More recently, the WHO report The Case for Investing in Public Health highlighted cost-effective interventions that provide returns on investment and/or cost savings in either the short or longer term. 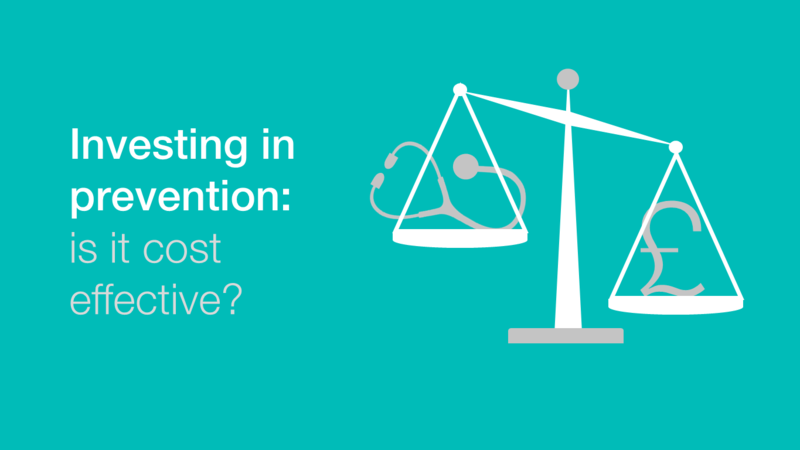 In assessing the cost-effectiveness of preventive interventions, compared with treatment, it’s only fair to take into account the longer time horizons of most public health interventions. For example, seriously tackling the obesity epidemic and ensuring that this does not afflict children of future generations is a major challenge: most measures taken now will only show success in 10-20 years’ time. Decision makers must be brave to invest in preventive activity of proven cost-effectiveness, even if the benefits may not be seen for a decade or more. It’s also important to look at discount rates when evaluating the cost-effectiveness of preventive activity. Discounting is used to compare costs and benefits that occur in different time periods, based on the principle that, generally, people prefer to receive financial benefit now rather than later. Would you as an individual value £100 now more than in a year’s time? Most people would answer ‘yes’ to that question, implying a positive discount rate. In simple terms, applying a positive discount rate to health means that we are immediately attributing higher value to health benefits received now compared with those received in the future. If we apply the same discount rate to preventative and treatment interventions, we will automatically bias decision-making towards treatment where benefits are realised within a shorter period of time. There is an ongoing methodological debate on this issue, but common sense tells me that preventive activity will always suffer when the same rules of appraisal are applied. Years of cuts to NHS public health budgets support this statement. In order to help make the case for investment in prevention we must also confront the thorny issue of perverse incentives. For example, it would be difficult to argue that we should not be investing in prevention of diabetes by tackling overweight and obese individuals, since we know that weight is a significant risk factor for Type II diabetes. Yet the health care system in effect rewards hospitals for dealing with the very complications of diabetes that we are trying to avoid by increasing budgets for treatment services at the expense of investing in prevention and early intervention. This may alleviate short-term pressures, but failing to invest in preventive measures is a ticking time bomb for the treatment services we are funding now. These perverse incentives exist in many other areas of public health and can only be tackled by adopting a system-wide approach, rather than budgets for treatment and budgets for prevention operating in silos. The evidence on the cost-effectiveness of public health interventions. In the third and fourth blogs in this series I will look at the issue of public health and cost savings, and the benefits of prevention to the wider health and social care system.